The Bubblehead Bride: Our Big News! This is the announcement that I used to post it to the world. I found a similar variation on pinterest and made it work for us. Then we found out they were twins and had to tweak it again. Regardless, I thought it came out cute. I love it and it was very nice to drive it north on our partial move (more on that later). 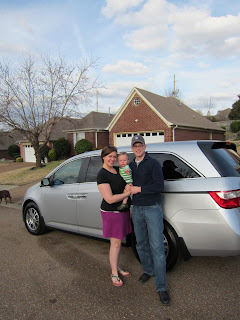 I just never imagined myself being a minivan kind of mom, so I am having some adjustment issues. It seems unnecessary with only one little one to tote around and I feel even weirder when I am the only one in it. I just keep reminding myself to enjoy the solitude because soon it is going to be packed to the brim with babies and dogs! Thanks so much, Colleen! I had such a fun time filling out the Liebster questions! Congragulations on expecting twins! That's one of the greatest surprises! I'm visiting from the Parties and Cardis blog and am a new follower! I can't wait to learn more about you and would love for you to visit my blog! Hi Caroline! I'm so glad you stopped by! I will definitely be checking out your blog!! Found your blog through wifessionals! Congrats on TWINS!! I am so excited to follow your journey! You will not regret a minivan that's for sure!! 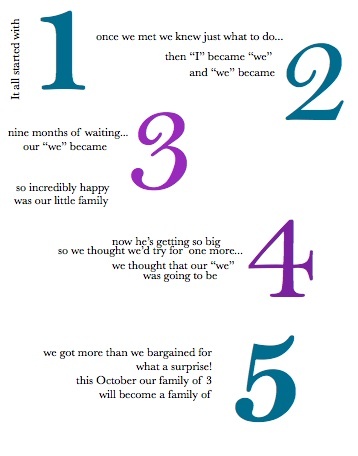 This is such a cute way to announce you are having twins! And congratulations!! !